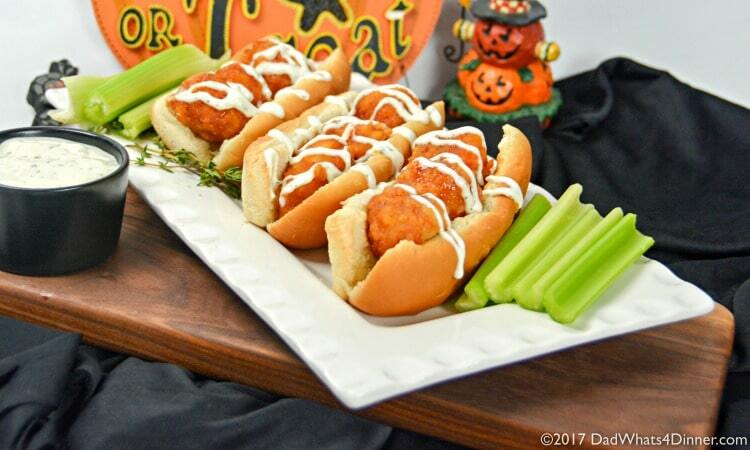 Try this Boneless Honey BBQ Chicken Roll with Creamy Ranch Sauce for a quick and simple trick or treat night snack you can make with your kids. 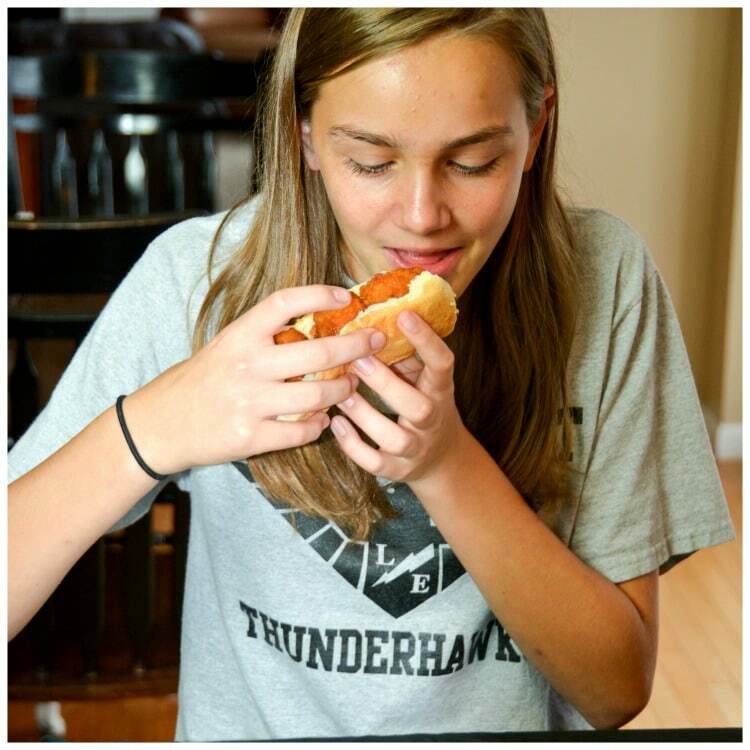 A great treat to fill their belly before they fill it with candy. Halloween will be a little sad around the house this year since all of our kids are now teenagers. Only my youngest Ella “might” still go out trick or treating. When the kids were younger, Halloween was a big deal. The house was decorated for weeks, and on Halloween night we had a fog machine going and scary noises. I would usually make a quick dinner for the kids because I didn’t want them running out of steam while jumping from house to house. I also wanted them full so they would not stuff themselves with too much candy. Many times I would grill sliders and hand them out, along with an adult beverage, to the neighbors as they came by with their kids. 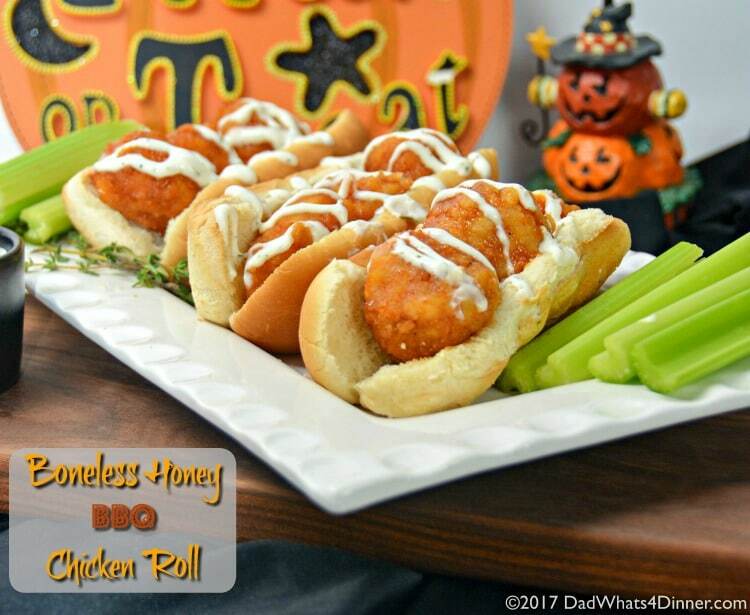 Since Ella loves to cook and has her own page on the blog, she came up with these Boneless Honey BBQ Chicken Rolls for this year’s Halloween meal. Now if your kids are like mine they would rather have boneless wings instead of traditional wings. 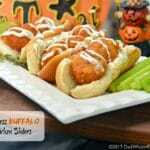 Ella and I decided to make these even better by adding the wings to a hot dog bun covered with creamy ranch dressing. This way the kids even in costumes will not get so messy eating wings. I found these awesome Tyson Honey BBQ flavored boneless wings in the frozen section of my local Family Dollar. While I was there I picked up the remaining ingredients as well as a new hand mixer so Ella could whip up her special creamy ranch sauce. I was pleasantly surprised that Family Dollar sold small appliances. I am always amazed what I find when I stop by. 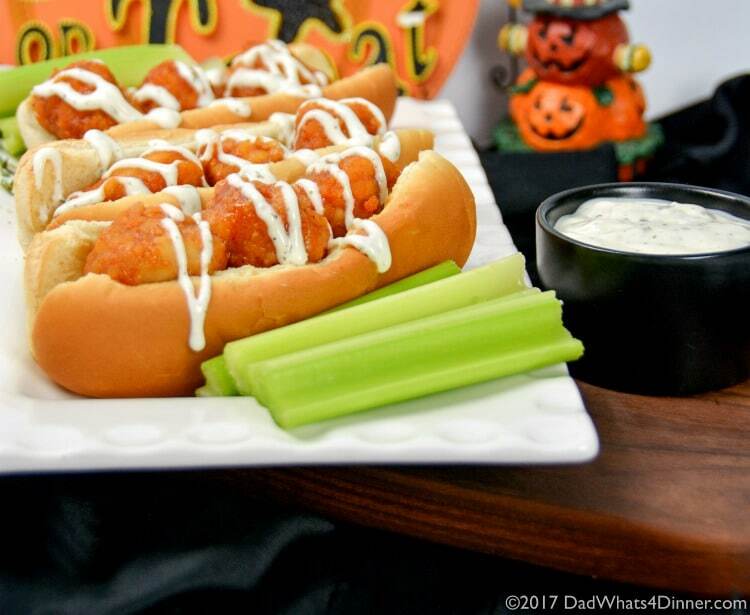 So if you still have young kids be sure to make trick or treating a fun night with Ella’s Boneless Honey BBQ Chicken Roll. 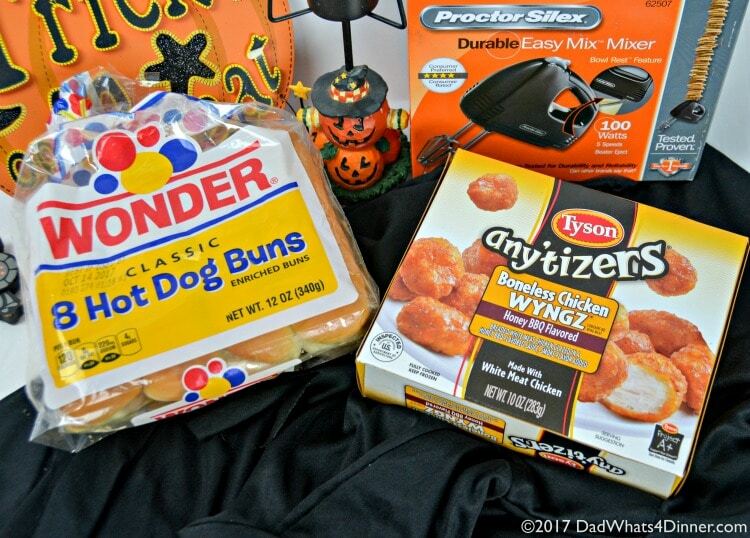 If your kids are a little older have them make this simple dinner and have fun by helping you hand out the candy. Be sure to check out Family Dollar’s weekly deals and their Every day Low Prices. Using a hand mixer, mix together the mayo, sour cream and milk until smooth. Add the spices and mix until combined. Add the lemon juice and mix again. Store in airtight container and chill in the refrigerator until ready to serve. Heat boneless wings according to package directions. 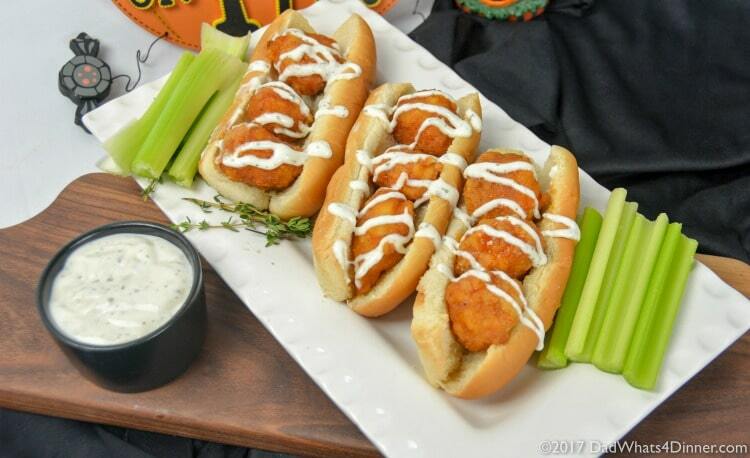 Place three boneless wings on each bun and top with creamy ranch sauce. Serve with celery and a side of mac and cheese. Using a hand mixer, mix together mayo, sour cream and milk until smooth. Add spices and mix until combined. Add the lemon juice and mix again. Store in airtight container and chill in the refrigerator until ready to serve. 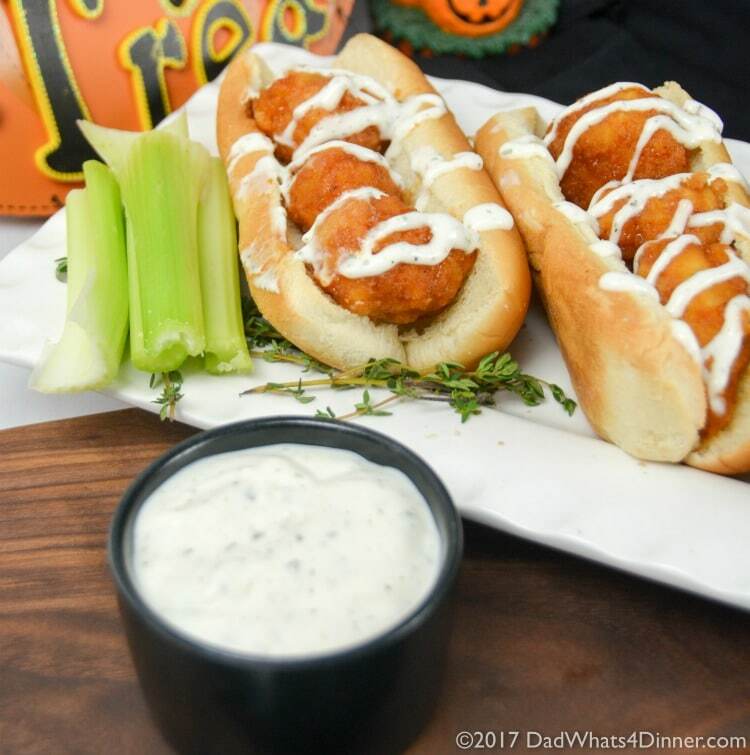 Place three boneless wings in each bun. Top with creamy ranch sauce. Serve with celery and a side of mac and cheese. 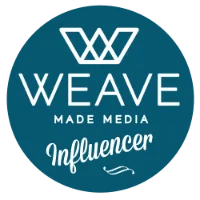 Be sure to check out Ella’s page and her Baked Cinnamon Sugar Tortilla Chips which is one of the most popular posts on Dad What’s 4 Dinner! Does your family have a favorite Halloween tradition?? These look so easy and delicious to make!